Once again, the Outsound Music Summit opened with Touch The Gear Night this past Sunday, in which the public is invited to come and, well, “touch the gear” and interact directly with many of the festival artists who use technology in their music. 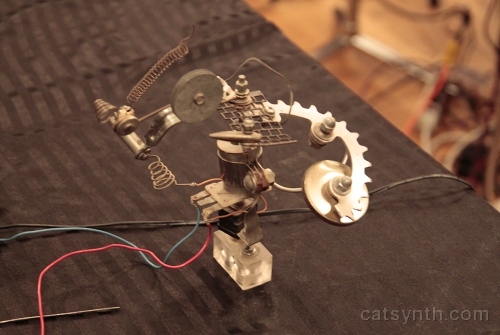 “Technology” included software, electronic devices, DIY projects, and mechanical and sculptural instruments. Basically, this was a subset of the gear I used at the Quickening Moon Concert (which was part of Outsound’s regular Thursday series at the Luggage Store Gallery). 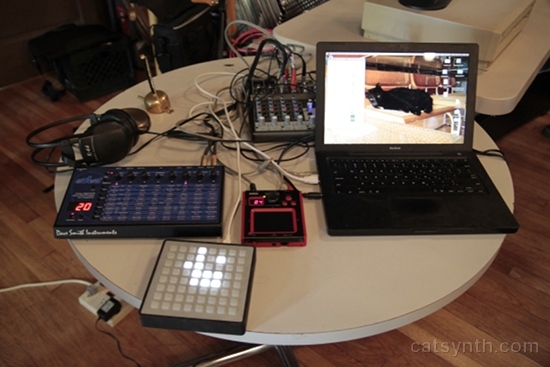 The monome was driving a simple software synthesizer, which along with the Evolver was being processed by the Kaos pad. The monome in particular attracted a lot of attention with its clean geometry and texture, and mysterious nature. It’s just an array of lighting buttons with no marking whatsoever, which invites curiosity. 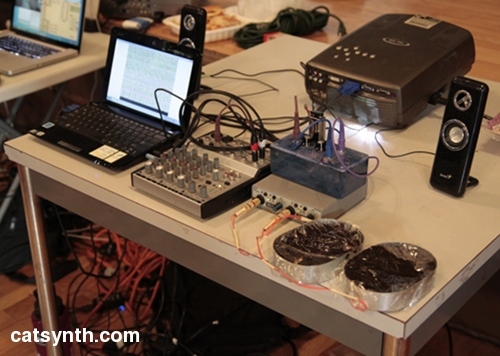 Travis Johns brought a highly portable version of his worms in compost, this time attached to an analog ring modulator and open-source software the implements Slow Scan Television. One could hear the noise generated by the worms (which was a low-level rumbling static sound) and see the corresponding image generated by the SSTV software projected onto a screen. Walter Funk presented a variety of instruments and objects, including Phoenix, a metal music object created by Fred the Spaceman. It was attached via contacts to an effect processor and a speaker, and could be struck or shaken to produce a variety of sounds. He also had an old Realistic (remember that brand?) variable-speed tape recorder that included a bucket-brigade (BBD) chip which could be used for a variety of pitch and time shift effects. It would be interesting to modify the unit to take live input in addition to recorded tape input, although the use of tape is part of the charm of such a device. Additionally, he had a small custom analog synthesizer made from inexpensive breadboards made by Elemco that were originally designed for test equipment. 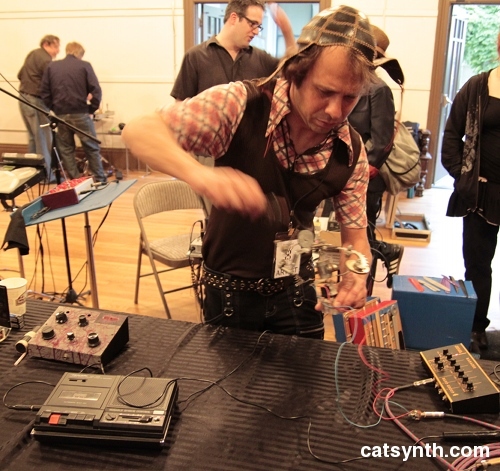 Tom Duff demonstrated the Sound Labs Mini-Synth, a DIY synthesizer kit designed by Ray Wilson. It’s a basic subtractive analog synthesizer, a la a Minimoog. More intriguing were the two generations of Bleep Labs Thingamagoop and Thingamagoop 2. The Thingamagoop 2 includes the photocell-and-light control and analog sound-generation from the original, plus an Arduino for digital sound and control. I want one of these! It was also fun to put the two generations of Thingamagoops together to control one another. 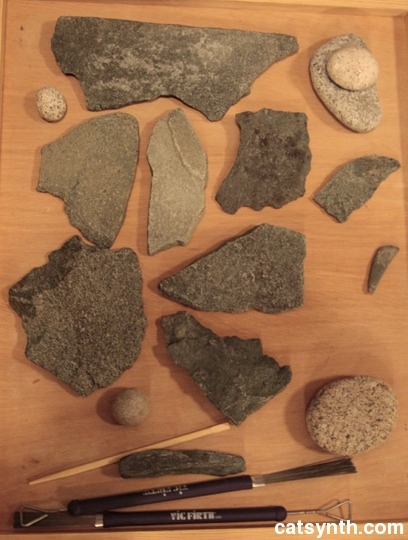 Cheryl Leonard brought some musical objects from Antarctica, including flat stones, bones and limpet shells. The stones had a high but short sound when struck or rubbed against one another. 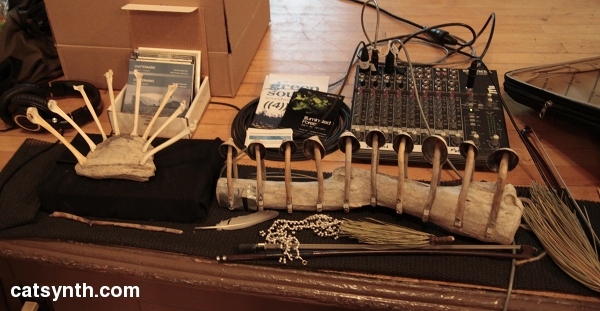 These were used in her Antarctica: Music from the Ice project. The limpet shells had a resonant sound with well defined pitches. I found myself playing a subset of three shells that together produced an interesting set of harmonies and intervals. 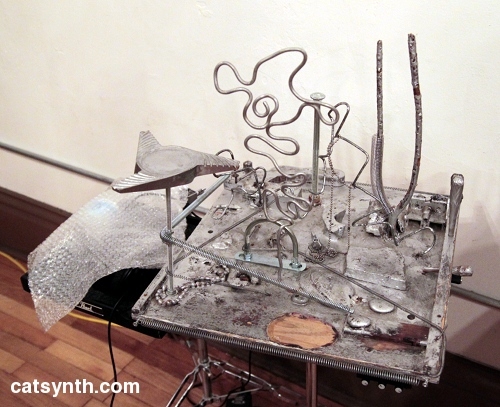 Bob Marsh demonstrated Silver Park, a beautiful instrument that started as a proposal for a park in Detroit with metal sculptures and structures. Marsh sometimes performs with Silver Park as part of his Mr. Mercury project. The instrument version features springs in addition to the original metal objects, which add to its timbre. In a quiet room (unlike the room we were in) it can be played acoustically, but it can also be played with microphones and electronic effects. Whenever I see pieces like this, I am inspired to create one of my own, but also reminded how much work it is to create sculptures with metal, adhesives, etc. I did get some tips on some “baby steps” to work with similar sounds without necessarily committing to a sculptural artifact. 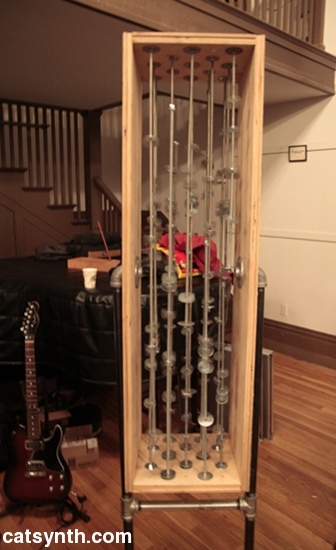 Another visually powerful instrument was Dan Ake’s 12×13, a large box with 1/4″ metal rods and washers. When the box is spun, the washers slide and shake along the rods producing a metallic cacophony of sound and visual motion. By spinning the box, or leaving it tilted at various angles, one can get the full effect of the falling washers, or freeze them in mid-fall to cut off the sound. 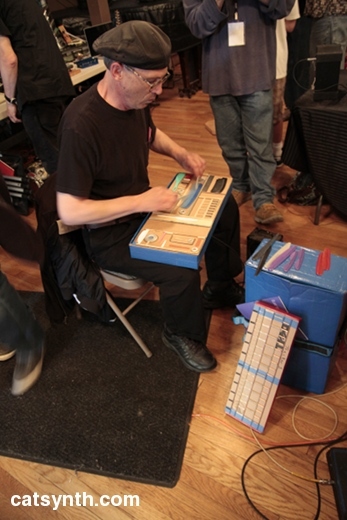 Philip Evert performed with an auto-harp processed by a large series of effects boxes. The control and sound of the effects chain was largely indeterminate, though the demo that I heard began with ring modulation before becoming a more complex mix. Tom Nunn brought his Skatchboxes for visitors to try out. Here were see T.D. Skatchit demonstrating the main Skatchbox. He is a virtuoso on this instrument, and we have reviewed his collaborations with Nunn in previous performances. The Outsound Summit included a demonstration and class on building your own Skatchbox, which sadly I was not able to attend. Mark Soden (of phog masheeen) demonstrated a chain of effects processors including a Electrix Filter Queen that produced chaotic oscillations when driven with an appropriate sound source. He had a Roland SP-555 to drive the effects, but the more interesting demo was using a trumpet with contact microphones on its body. One could generate sound by blowing, tapping, or otherwise exciting the body of the trumpet which then drove the chaotic effects processing. Amy X Neuburg demonstrated the two instruments I have seen her use in her live sets. The Blippo Box produces chaotic signals that are compelling and very easy to play – the effect of turning knobs on the sound, even if it was unpredictable, was very smooth. Of course, the challenge is that the instrument is so chaotic that is very difficult to reproduce the same exact sound twice. 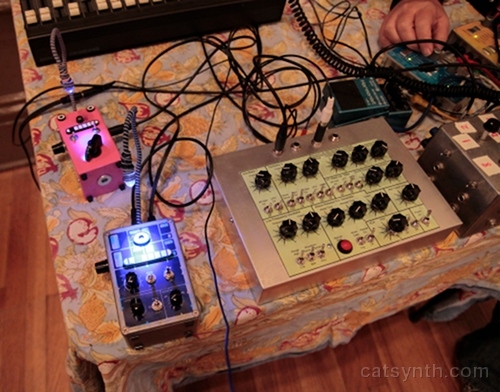 She also showed her looping setup, which included a drum pad and an Echoplex. Rick Walker demonstrated his new “Walker Manual Glitch pedal”. It featured both built-in sound generators and live input, and the ability to “glitch” or reply snippets of sound from any of the sources. This seems like it will be a powerful instrument, especially when combined with loops as input or a live improvised performance. Thanks to Matt Davignon for organizing this event! He was also a presenter and showed off his drum machines and effects boxes that he has used in many previous live shows.